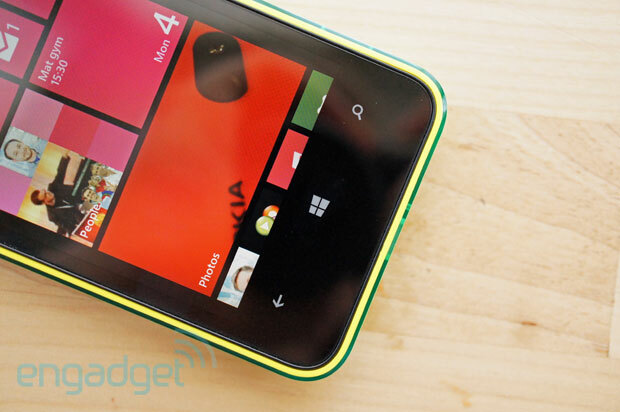 The Lumia 620 is Nokia's most affordable Windows Phone 8 device yet. Alas, it's a device that might never make an appearance in the US, due to its very attractive pricing of (£150, or around $236), unless American carriers are willing to give a rebate from the outset. But it's a surprisingly attractive Lumia -- in fact it's hard to put it in the same category as Nokia's previous cheaper Windows Phone options. Those colors hit you right between the eyes, with matte- and gloss-finish covers in cyan, lime, yellow and magenta presenting a nice alternative to the more staid black and white versions. Behind that shell, a 1GHz Snapdragon S4 Plus beats away, with a bright 3.8-inch ClearBlack display beaming out a familiar 800 x 480 resolution. Despite the price, it's running the latest iteration of Windows Phone 8 and Nokia's also ensured its own camera lens apps, along with its music and mapping services, have been carried over as well. The 5-megapixel camera may be bested by the Zeiss-equipped 8-megapixel sensors on its bigger brothers, but with a staggering £300 difference between the Lumia 620 and Lumia 920, what other sacrifices have been made? Is this the best bang-for-your-buck Windows Phone we've ever seen? We think it might be. 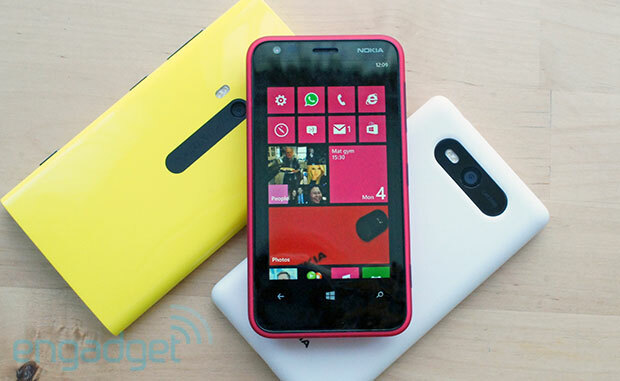 The Lumia 620 is a budget phone offering good performance and an attractive design. It sets a new benchmark for low-price smartphones. 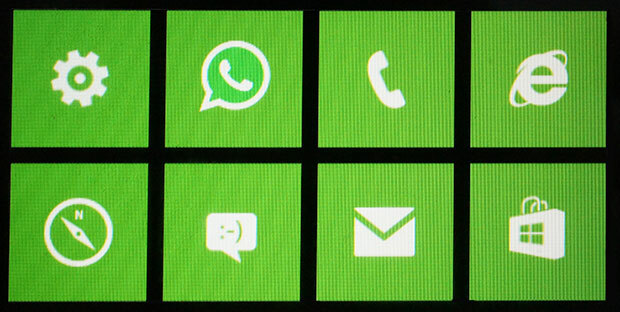 How would you rate the Lumia 620? After trying out both the Lumia 920 and the Lumia 820, it's a relief to see Nokia's phone footprint shrink so that it's closer to 2011's Lumia 800. The 620 model has a marginally larger screen than that polycarb-crafted phone, but it feels just as comfortable in our hands -- one-handed use is a non-issue. While the screen's surface is completely flat, the edges curve around gently, forming a rounded back. Due to the way the covers are formed (two different color layers, for the likes of the lime-green and orange options) they've come out in very vivid hues. The entire cover can be pried off by pressing down on the camera unit and pulling at the top edge of the covering. 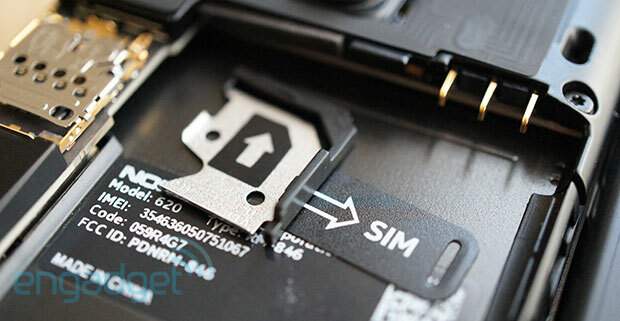 Does it feel as plasticky as the Lumia 610? Nope. Wobbly? A little -- there's a minor amount of give in the center of the back, but the cover and device feel unified and solid. Better still, due to the way the covers are formed (two different color layers, for the likes of the lime-green and orange options) they've come out in very vivid hues -- the soft-finish cyan shell is this editor's personal favorite. The cases can also take a fair amount of damage from drops, with the easily breakable headphone port built into each case rather than the phone itself. Nokia has added a front-facing VGA camera to this model (a first for an entry-level Nokia Windows Phone), while a 5-megapixel sensor and flash are centered on the back. For fans of the Lumia series, the front is even more familiar. The screen is framed with about 2mm of bezel at the sides, with space above it for the aforementioned VGA camera and earpiece. Below the TFT screen, you'll find the staple three-button capacitive control panel. Along the right edge, there's still a hard camera button -- and all the buttons seem to have more give than last year's Nokia devices. The micro-USB port sits along the bottom with the primary microphone, while the headphone socket belongs at the top, replete with a secondary mic. It's worth mentioning that the Lumia 620 has been gifted with the same distortion-free, high-amplitude mics embedded inside the Lumia 920 -- more on that in the camera section. Meanwhile the Lumia 620's built-in speaker is apparently 20 decibels louder than Nokia's flagship phone, able to penetrate thin walls at a maximum of 100 decibels. If you want your music louder, the phone is also compatible with JBL's wireless speakers through its built-in NFC, while a removable 1,300mAh battery resides next to the space for a microSD card. There's already 8GB of built-in storage from the outset, while Microsoft is still offering 7GB of cloud storage through SkyDrive -- in short, there are plenty of storage options. There's just 512MB of RAM, but that's plenty for handling the existing app selection on Windows Phone -- we didn't have any issues using Skype or other apps, although we can't vouch for how future-proof this phone will be compared to Windows Phone devices housing 1GB of RAM. The handset isn't going to weigh pockets down at 127 grams, but it's not the most slender phone out there, either. At 11mm (0.43 inch), it's actually incrementally thicker than the Lumia 920, but with this smaller form factor you shouldn't have any issues with one-handed control. Nokia's new phone is more comfortable to use, even if that means there's less screen to play with. If you've been looking for a sub-4-inch Windows Phone 8 device, options have been pretty limited as of late. But here, you're getting a display that's appropriate for the price: a 3.8-inch touchscreen that matches the resolution of most Windows Phones -- that is, 800 x 480. Nokia's included its ClearBlack tech and an RGB Stripe pixel arrangement, while adding an anti-glare layer to improve outdoor visibility. Stack it against the Lumia 820, and it requires a bit more explaining. In a way, the 620's screen looks better -- it's the same number of pixels in a smaller space, but it's no longer AMOLED. Colors appear slightly more muted on the 3.8-inch TFT in comparison, although it also lacks AMOLED's bluish overcast in white areas. Now, after dabbling with 4.7-inch displays you might think that the smaller display would make web browsing a little more frustrating, but page formatting remained pretty much identical among the three Windows Phone 8 Lumias. If there was one feature that we expected to be underwhelming, it was the camera. Despite the extent to which Nokia raved about the prowess of its optical image stabilization and Carl Zeiss lens, you won't find either here. Maximum image resolution drops to five megapixels, but the sensor is still capable of 720p capture, with an LED flash potent enough to light up your subject -- it's possibly a little too strong for close-up shots. The physical button launches into the camera almost immediately, with none of the lag of its predecessor, and with the same ability to lock focus with a half-press. We found in most situations that tapping the screen to focus offered a better lock. Unfortunately, we've still got the same complaints that we mention in most Windows Phone reviews: there's no HDR mode and the UI itself is relatively low on customizations. The camera was able to take a handful of decent stills, although focus seemed slightly more temperamental than on other Windows Phones we've tested in the past. It still managed to give us some passable results in less favorable conditions, but if we were aiming for a close-up shot in better light settings, that reduced resolution made itself known in not-so-detailed results. That said, there's none of the fuzz and noise we've seen from other sub-£200 smartphone cameras we've tested in the past 12 months -- we're pointing our finger squarely at some of ZTE's and Huawei's cheap carrier-specific models. Unfortunately, we've still got the same complaints that we mention in most Windows Phone reviews: there's no HDR mode, the UI itself is relatively low on customizations and there's no way to lock down exposure to avoid blowing out your images in bright light. However, the Panorama mode (above) and Nokia's GIF-crafting Cinemagraph are worth installing as they both add some extra talents to the camera. More interested in video? Well, the Lumia 620 gives a decent showing here too. There's no optical image stabilization, but that remains a very rare addition to phone cameras, so it's hard to hold it against a colorful, rich recording. While a bit of breeze buffeted the mics, it picked up our voice (and some waterfowl noises) with perfect clarity. So, the Lumia 620 has the same resolution of the Lumia 820, memory expansion through microSD and even a pair of high-amplitude mics, but we had to see how Qualcomm's lesser Snapdragon S4 Plus processor would handle an almost-identical Windows Phone UX. You can lay any of those concerns to rest, as the 1GHz dual-core processor offered up a very similar experience; you're getting far more than what you pay for. We ran the Lumia 620 against both the Lumia 820 and Lumia 920, and found that the only major differences in performance were the startup times, with the smaller phone taking about five seconds longer to reach the home screen. Scrolling around on Internet Explorer 10 on any device resulted in largely the same level of speed and responsiveness, a testament either to Microsoft's mobile browser or to Qualcomm's processor know-how. The dearth of highly polished Windows Phone games to push the technical abilities of the hardware makes it even harder to differentiate real-world performance between the three phones. The 1,300mAh battery inside is smaller than the one found in the Lumia 800, although this time it's thankfully replaceable. During our WPBench rundown tests, which push the processor to the max until the battery cuts out, we averaged a time of 3:41. That puts it below the Lumia 900 but more than an hour beyond most Windows Phone 8 devices. It even bests the hardy HTC 8S. Naturally, this isn't representative of the battery with more moderate use, but the Lumia 620 did better in this regard, too. It typically gave us two days of use before cutting out. This entailed plenty of web browsing, listening to offline playlists and a handful of calls and email replies. Its benchmark results don't stand up to phones with beastlier processors like the 820 or 920, but the 620 still manages a respectable sub-1,500 score on SunSpider. Meanwhile, the dearth of highly polished Windows Phone games to push the technical abilities of the hardware makes it even harder to differentiate real-world performance between the three phones. On the rare occasion the device froze, it was often during data upload from the camera app to SkyDrive, but the experience was otherwise smooth and without issue. The HSPA+ radio (WCDMA 850/900/1900/2100 and GSM/EDGE 850/900/1800/1900) promises speeds up to 21 Mbps down and 5.7 Mbps up. During our tests on Three UK, we were picking up download speeds of around 5 Mbps, while uploads hovered just below 1 Mbps. The good news is that this phone will work on both AT&T SIMs and T-Mobile's recently claimed 1900MHz HSPA+ spectrum, both data and voice. If Nokia US decides to offer the phone directly to customers, it could prove to be a tempting introduction to Windows Phone without the fiscal carrier hangover. Read our Windows Phone 8 review? 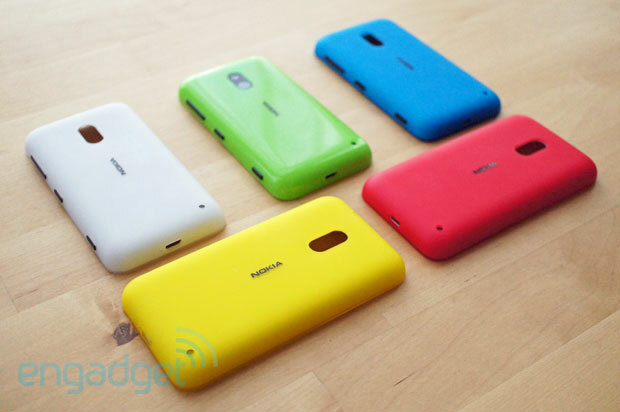 Or our reviews of those bigger Nokia models? Then sadly, there's not much new to tell you here. But that's actually good news -- despite those lower specifications, the phone gets Nokia Music and Maps, not to mention those Lumia-specific camera enhancements. Mix Radio throws in a substantial amount of offline music your way for free, while Nokia's map navigation loads quickly and reliably. There's also the option to download countrywide maps ahead of any trips abroad. Problems still left to be solved include some major apps that are MIA, including Dropbox, Instagram and Spotify -- the music service remains available on last-generation Windows Phone devices. Despite that Xbox brand association, gaming remains a shallow experience. If you're making noises about having Angry Birds in 2013, there's an issue. It's also worth mentioning that after getting hands-on with (and feeling underwhelmed by) Windows Phone 7.8, we can't recommend picking up those old Lumia devices, even when they can now be bought for a similar price to this new Windows Phone. To get the full experience -- and join an app selection that will grow in the future -- you're going to have to pick up the Lumia 620, 820 or 920. Another benefit to the off-contract phone means there's no carrier bloatware to be found. The apps that do arrive pre-installed are mostly worth keeping around and getting rid of unwanted programs is just a long-press away. 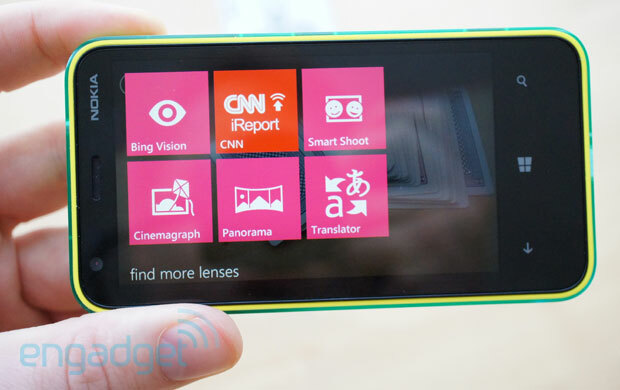 The Lumia 620 represents a new high-watermark for entry-level smartphones, regardless of OS. Ignoring the app drawbacks, the phone provides a great web browser experience alongside the full Windows Phone 8 feature set. It could be a very exciting phone for Nokia -- it's an exciting one for us. We've mentioned the price several times during the review, but for a new smartphone with the latest version of its respective OS, it's a steal. The phone might house a less-capable camera, but for anyone sick of oversized, unwieldy, expensive smartphones, Nokia now has an entry-level Windows Phone to lure the bargain-hunting crowds away from Android, if the Nexus 4 proves too expensive. What's more, it's arguably more attractive than most Google-powered phones around the same price point and could prove to be a huge hit among smartphone beginners. There's also a good chance that the more-gadget obsessed might pick up the Lumia 620 as a second device to give Microsoft's mobile OS a try -- and with compatibility on two US networks, it might be worth an import. It delivers real-world performance as good as Windows Phones that cost more than double. If anything, it's making us reconsider whether those other rivals are worth the extra outlay.